I’m having a hard time pinpointing exactly what it is about the Milnes-Daimler Omnibus that makes me so uncomfortable. This thing is bulky. It’s big. It looks like it shouldn’t function and yet somehow it did. People of the early 1900s, tell me what you were imagining with this bad boy. Public transport in big cities like London has always been a concern. 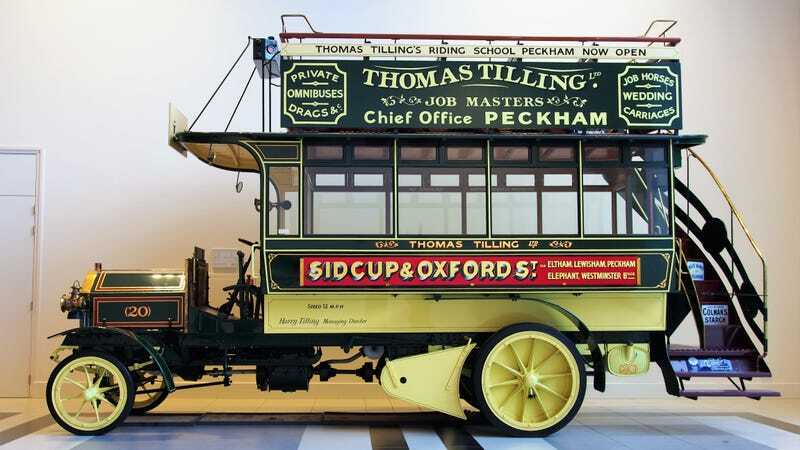 Not everyone was keen on using subway systems, and with horse and carriages fading out, Daimler teamed up with British tramcar and lorry maker George F. Milnes and Co. to develop an actual, motorized double-decker bus in 1902. Somehow, people looked at this contraption and said, “yes, that is exactly what we need”. And so the next year, they had their first production model out on the streets. People liked it. People looked at this omnibus, climbed on, and enjoyed themselves so frequently that by 1906 there were four hundred of these things on the streets. This beast had a whopping four cylinders producing 28 horsepower. The top speed? Twelve miles an hour. Not a bad feat for its day, but also, dear God. I’m just sitting here imagining how horrifically slow it would be weighed down with rush hour travelers and it’s causing me distress. Probably because this thing looks like it belongs on a horror movie set. I’m honestly kind of shocked that Rob Zombie hasn’t bought a Milnes-Daimler omnibus, thrown in some clowns and a questionably cheesy murder, and played it on the big screen. The steps are on the outside of this thing, and honestly, it looks like it’s just barely holding together. Yes, the folk back then were perfectly capable of producing massive machines that could cross countries, but something about the unbalanced proportions has me worried. I doubt the omnibus could make any turns fast enough to tip it over, but you just never know. It looks like when you’re playing Jenga and you’ve gotten rid of all the easy-to-remove pieces and now just one wrong look could spell disaster. What if a rock hits the omnibus the wrong way? Can it withstand a pothole? Dear lord, the wheels are so small! I might be concerned because all Milnes-Daimler had to do to turn a bus into a dump truck was make a few changes, like getting rid of windows. The partnership between the German Daimler and British Milnes companies didn’t last through the First World War. I’m kind of sad we didn’t get to see any other wild contraptions of theirs, but at the same time, it was, uh, probably for the best.